All of us in the zoo and aquarium community care about wildlife conservation and animal welfare. But how can we juggle the financial constraints of our organizations with the growing demands to help species in the wild—as well as the need to provide the best life possible for the animals in our care? How can we determine our specific niche in the wildlife conservation landscape, to ensure that we're accelerating the pace of conservation and not just competing with others in the field? Most of all: how can we get the buy-in we need from staff, board, and volunteers to make sure that all our oars are rowing together? A new book headed for San Diego Zoo Global's online store, Shopzoo, (and elsewhere) explores the way that San Diego Zoo Global (SDZG) embraced a transformational strategic plan to navigate these decisions, and offers tips about how you can create a plan to guide your own mission-driven revolution. 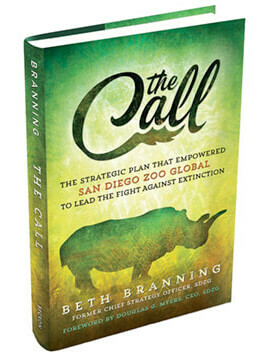 The Call: The Strategic Plan That Empowered San Diego Zoo Global to Lead the Fight Against Extinction explains how SDZG created a blueprint to make tough choices and to commit to them over time. Learn more about the book and pre-order your hardcover or paperback copy at shopzoo.com. Faced with the increasing rate of wildlife extinction, SDZG felt compelled to evolve into an organization that could make a significant impact on dwindling animal and plant species in the wild. The Call tells how many on the staff and board of trustees were concerned that this direction would not be financially sustainable, and could have a negative impact on animals, plants, and guests at the San Diego Zoo and the San Diego Zoo Safari Park. The strategic plan provided the focus, prioritization, and inspiration to mobilize thousands of employees and volunteers to rally behind a vision of leading the fight against extinction. The Call doesn't pull any punches—it details the harsh realities and setbacks for the organization as they worked toward this transformation, and how they learned from their own mistakes. Bringing wholesale change to a 100-year-old nonprofit did not happen overnight, and was often messy and uncomfortable. The Call shares the disagreements, false starts, and rude awakenings—as well as the victories and successes. You'll hear from board members, frontline staff, managers, and volunteers who experienced the highs and lows firsthand. How to get every staff member and volunteer to understand—and share—your vision for the future! Chances are that you struggle to balance your organization's aspirations with the realities of its resources. It's also likely that you dream of exponential change for yourself or for your organization, but you can't imagine how you will get your stakeholders to rally around your dream. The Call will change the way you look at strategic planning—and get you excited about creating your own transformation. "San Diego Zoo Global has a strategic planning process unlike any I've encountered. You see it in the way the organization has focused on their commitment to conservation, and in the fact that their front-line employees can quote their vision verbatim. I've worked with Doug Myers and Beth Branning on strategic plans for several organizations and I have seen firsthand how powerful this process can be." The book will make its first appearance anywhere at the San Diego Zoo Global booth at the AZA Annual Conference in Seattle! Please come see us at Booth #721. 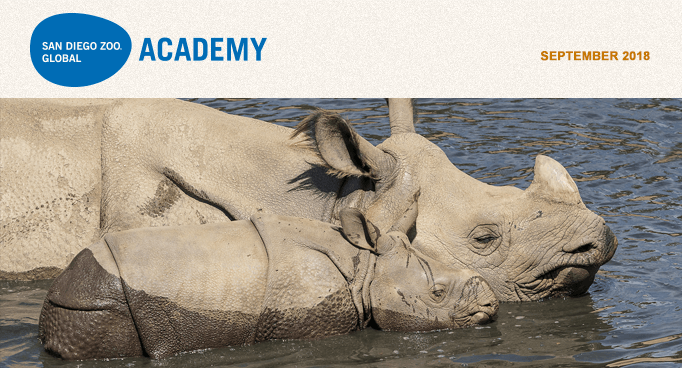 Learn more about the book on the San Diego Zoo Global Academy website. If you have questions for the author, contact Beth Branning at beth@branningstrategies.com. The Essex County Turtle Back Zoo in New Jersey is part of the Academy's collaborative learning environment! One of the highlights of each year is to talk training with everyone at the Association of Zoos and Aquariums (AZA) Annual Conference, and this year's event is September 23–27 in Seattle. See you there—we will be at Booth 721. We know you have a lot on your hands when it comes to providing training for your staff and volunteers. What if there was a way to make sure they're learning exactly what you need them to know, in just the right sequence? Meet Learning Paths! This new feature of the CypherWorx Learning Content Management System lets you organize a sequence of specific steps (containing courses, events, discussions, and resources) for completion by your learners. Learning Paths can be used to walk new staff and volunteers through the onboarding process, support learners who need to gain expertise in a specialized subject area or certification, and more. They can reduce admin time by assigning courses automatically, based on results, and help you to keep training and documentation organized. Check out these resources to learn more! Join us on Thursday, October 11, 2018 at 10 a.m. Pacific Daylight Time (PDT) for the next "Ask Animal Care" teleseminar with Bernadette Juarez, deputy administrator, USDA, APHIS; Elizabeth Goldentyer, DVM, associate deputy administrator of animal care; and Robert M. Gibbens, DVM, director of animal welfare operations. Register and submit questions to info@excellencebeyondcompliance.com. For more information on EXCELLENCE BEYOND COMPLIANCE® visit excellencebeyondcompliance.com. Please join us for the Administrator's Users Group Webinar, hosted by Academy partner CypherWorx. The next webinar is Wednesday, September 19, at 11 a.m. PDT. In my last few articles, we discussed osmoregulation in freshwater and marine teleosts. Osmoregulation is the active regulation of the osmotic pressure of an organism's body fluids to maintain the homeostasis of that organism's body water. This month, we will look at elasmobranchs (sharks, rays, and skates). Ninety percent of elasmobranch species live predominantly in a marine environment. The critical difference between marine teleosts and marine elasmobranchs is that the teleosts are hypotonic to seawater, while the elasmobranchs are, in fact, slightly hypertonic. Normally, seawater has a salinity of approximately 35 parts per thousand (ppt). The internal salinity of a teleost is between 9 and 10 ppt, while for an elasmobranch it is 36 to 37 ppt. Teleosts produce ammonia as an end product of protein metabolism. All elasmobranchs (except for the Potamotrygonidae family) are ureotelic, in that they produce urea as the end product of protein metabolism. Other ureotelic organisms are land (adult) amphibians and mammals. This metabolic process occurs in the liver. Plasma urea levels usually contribute about 30 percent of plasma osmolality. Urea is needed for normal cell function in elasmobranchs. Because the blood urea level is so high and the seawater level is lower, there is an outward diffusion gradient across the gills. Various aspects of gill structure and function prevent massive losses of urea across gill membranes. The kidney plays a major role in maintaining high serum urea levels, by reabsorbing most of the urea from the urine. Less urea is lost via the kidneys than occurs across the gills. Following death, it is the high urea and TMAO tissue levels that cause elasmobranchs to smell so quickly. This is compounded by the presence of enzymes and bacteria in the tissues that break down the urea to ammonia. The higher osmolality of elasmobranchs compared to their environment causes a slight water influx to occur from the surrounding seawater. This extra water is then removed via the kidneys through urine production, which occurs at a slightly higher level than in marine teleosts. The excess salt levels caused by the seawater influx are dealt with by the rectal (or salt) gland. Marine elasmobranchs can drink, but generally do not take in much water. Some elasmobranch species, however, can control their drinking rate to regulate their osmolality, in response to rapidly changing exposures to salinity. It is this very different osmoregulatory control that creates problems when considering a hyposalinity treatment for parasites in a mixed teleost and elasmobranch exhibit. The teleosts are usually fine, but it can create issues for the elasmobranchs, which can retain water and swell up. For many years, the coelacanth (Latimeria chalumnae) was considered extinct, until a specimen was found in South Africa in 1938. If you want some fascinating reading, there are various books on the rediscovery of the coelacanth. Interestingly, coelacanth osmoregulation is very similar to that of elasmobranchs, with high levels of urea and TMAO. I look forward to seeing some of you at the AZA Annual Conference in Seattle later this month. Come visit me at Booth 133, and drop by and say g'day. I would love to talk to you about our new penguin and aquatic birds module.